Did you ever watch The Office (US version)? Dwight was one of my favorite characters, I loved how he was all kinds of inappropriate to the point of offensiveness and then you’d get a rare glimpse of his kind-heartedness. Whenever I cook anything involving beets, I think of Dwight and his beet farm. Fun fact – beets are known as beetroot in the UK. If you buy beets of a similar size, they’ll cook at the same rate which makes life easier. Beets are also pretty flexible, you can roast them high and fast or they’ll happily hang out at a lower temperature if you happen to be braising something else in your oven. 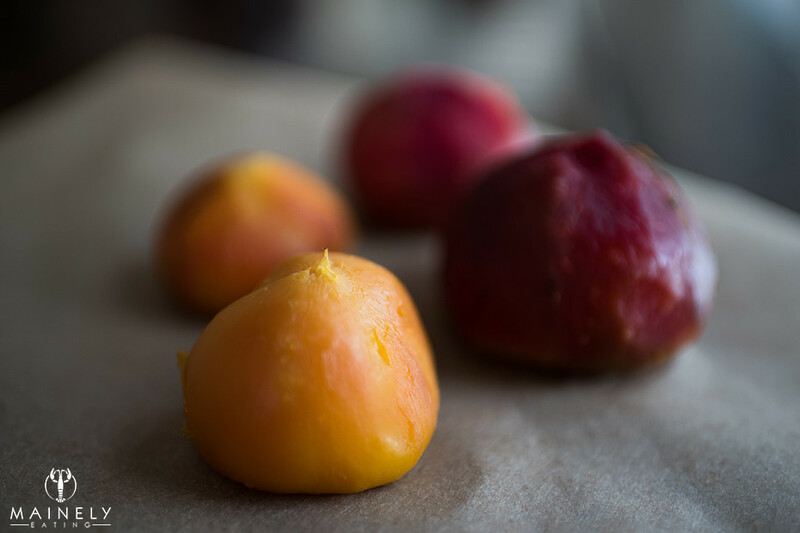 I usually roast my beets in a little foil packet (skins on) with a splash of olive oil until a cake tester or toothpick slides easily through, slip the skins off, slice and then toss them with a little oil and vinegar. Small beets might be done after 45 minutes at 375 degrees. Large beets might take 2 or 3 hours at 300 degrees. They’ll happily sit in the fridge for a good 4-5 days ready to be added to your salad of the day. And if you’re not in the mood for cooking beets, I’m a big fan of the fresh packages of white wine and balsamic organic baby beets you can find in the store from “LoveBeets” Clockwise from top left: skin-on beets about to go into the oven, using a paper towel to slip off the skins, sliced beets, sliced beets in a little olive oil and vinegar ready to eat. So, you’ve roasted your beets, now what? Now you need some kind of soft cheese. If you can lay your hands on Meredith Dairy marinated cheese, also known as cheese crack in our house, then it’ll be a happy day. 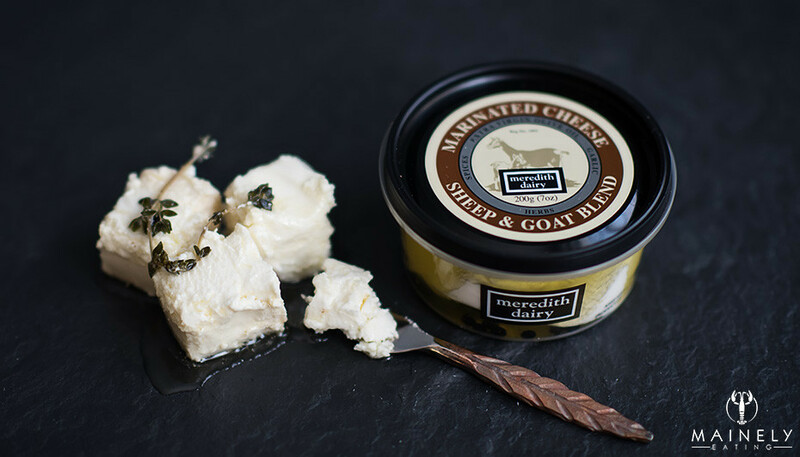 Don’t be put off by the name, I realize that “Sheep & Goat Blend Marinated Cheese” doesn’t exactly sound appetizing but this soft, rich and creamy cheese has just the perfect hint of thyme and garlic and will blow your mind. You can find it in Whole Foods, the Cheese Iron in Scarborough and even Market Basket. If you can’t find the above cheese a regular log of soft goat cheese works great. If you’re not a fan of goat cheese, try regular cream cheese or Boursin garlic and herb cream cheese. 1. Preheat oven to 350 degrees F. Place beets (skins on, you can remove the leafy tops and tails) on a large sheet of aluminum foil. Drizzle over 1 tbsp olive oil. Loosely crumple the foil at the top to enclose the beets. Place foil packet on a baking sheet and pop into oven. 2. Exact cooking time will vary with beet size. I usually roast beets at 350 degrees and they’ll take 1-3 hours depending on their size. If you’re cooking something else and need your oven to be cooler or hotter just adjust the cooking time. Beets are done when a cake tester or skewer slides easily through to the middle. 3. 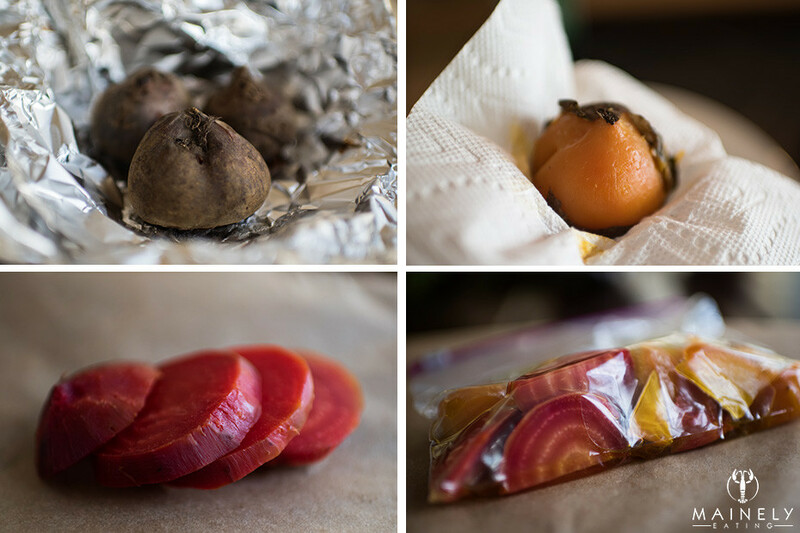 Leave beets to cool in the foil packet. There will likely be a little liquid in the bottom of the foil packet (condensation and beet juice), turn the beets so that all sides get to lie in the liquid, this will help the skins to slip off more easily). 5. Slice beets into wedges and toss with 1 tbsp good olive oil, 1 tsp vinegar and salt and pepper. 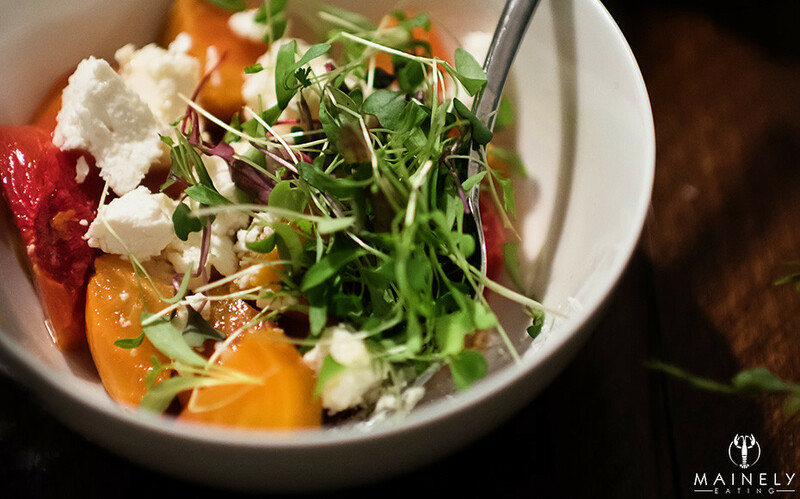 Divide wedges of roast beets between two bowls, crumble over goat cheese. Add any other salad items you have in the fridge – tomato wedges, sliced cucumber, baby greens. Drizzle over a little oil and vinegar. 3. 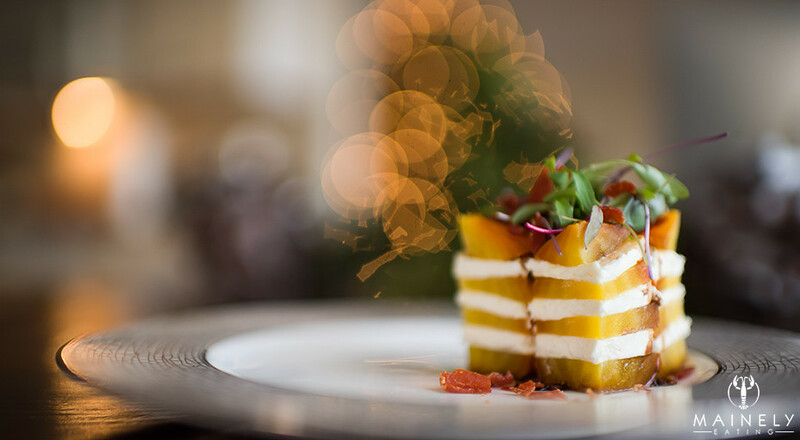 If you want to get all fancy, maybe impress a special someone, then try a beet and goat cheese tower. Roast your beets per recipe above and let cool. Remove a very thin slice from the bottom of each beet (so they’ll stand up on the plate) and then slice them horizontally. You’ll want 3-5 decent sized slices. Spread each slice with your choice of marinated goat cheese, Boursin cream cheese or other soft cheese and then refrigerate for 30-60 minutes. Don’t skip this step. You need the cheese to harden before you slice. If you skip the refrigerator and slice the beet/cheese stacks immediately, everything will just smush under your knife. 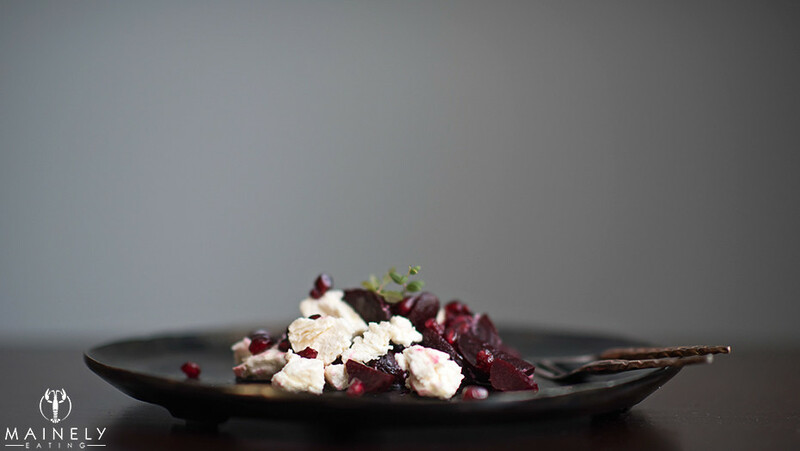 Once your little beet and cheese towers are chilled, use a large sharp knife (wipe it clean in between each slice) to cut the beet tower into 4 quarters. Turn the quarters “inside out” when you plate them so that the inner corners become the outer corners and your beet tower has a square appearance. Fill the inside of the tower with baby greens (and crumble over some bacon if you have it!). Enjoy! Once you’ve tried roasting beets for the first time, the possibilities are endless. Make a beet and blue cheese checkerboard, beets also pair well with crunchy walnuts and they liven up almost any salad. This entry was posted in Appetizers, Entertaining, Healthy Eating and tagged Beet & Goat Cheese Towers, Roast Beets by Mainely Eating. Bookmark the permalink.